The ciosan is a small, closely woven basket, formerly made on the Western Isles and along the west coast. 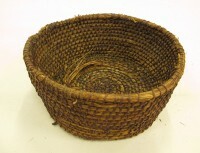 It is a coiled basket made from sea-bent (marram grass), or sometimes straw. The coils are stitched together using twine made from rush, marram, even split willow or bramble, or bought twine.